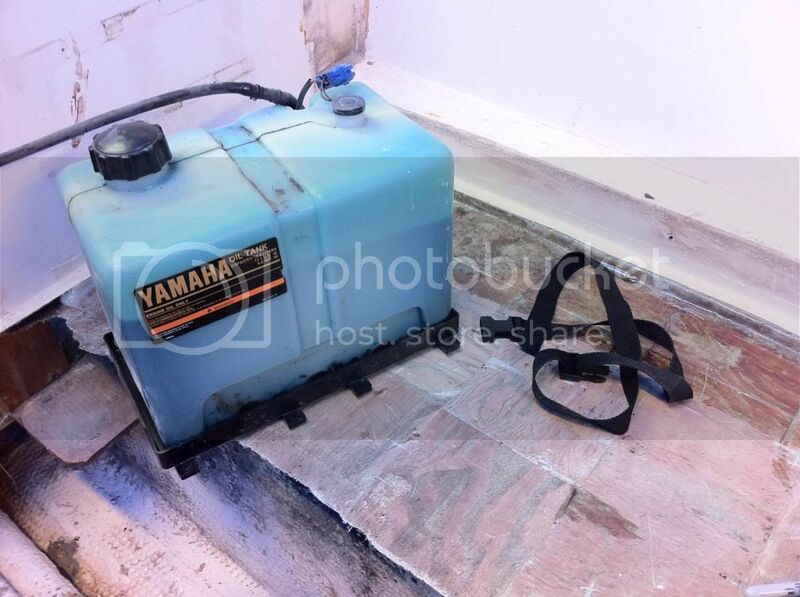 So as I was working on rebuilding the floor, I happened to take a look at the remote oil tank (boat side) hold down (Yamaha OEM) and noticed it was starting to have seen better days. Rusted, but still relatively solid -- nothing some sandpaper and paint wouldn't fix. But, I thought that maybe I should replace it anyways... Until later that night when I checked pricing -- holy cow!!! For a piece of stamped steel?!?! Nope - no way I was pulling the trigger on that. I don't mind putting money into the boat, but I prefer it to be wisely spent, not absurdly wasted. So to the back of my mind it goes - worry about it another time. Well, the next week I happened to catch another glimpse of the oil tank -- then the battery tray -- then I looked back at the tank... Then the tray... Then the tank again. "Nah" I told myself, it can't be that simple... Can it? Yup! A $9 battery tray for a group 31 battery fits PERFECTLY! I'm OK with spending $9.. Here's a picture. I can't imagine I'm the first one to think of this (I'm rarely the first one to think of ANYTHING! ), but as I was searching this site (that first night) and the 'net for a less expensive option to the OEM hold down, I didn't come across this battery tray as an option. So just thought I'd share! Sure now u tell me after i spent over 200 bucks for stainless steel oil tank holders.. I put it "in it's place" over the weekend. It holds it perfectly. Honestly, didn't think it would be a problem -- given that it's a heck of a lot lighter (even when full) than a battery. If it's good enough for a battery, it's more than qualified to the hold the oil tank. Try 2 camel backs and a bungee cord. Good idea. It's "in it's place", but it only takes about 30 seconds to get it out. Maybe I'll order one to have an extra on board. Bump...is this the 2.5 or 5 gal tank? It's the 2.5g tank. Honestly, didn't even know there was a 5g. No reason you couldn't use the eyelet/strap setup (without the tray), though. Heck, get some inexpensive PVC or fiberglass L-channel (say 1' or 1-1/2") and create a "fence" for the tank. It wouldn't have to be a full fence, either. Thanks both....I bought a couple Group 31 trays...see how those work...and good idea on just using the strap and eyelet if need be. Plus my engine manual says 2.8 gal tank so unless one of the 2 previous owners swapped out the tanks at one point I'm probably good. I made a U-shaped platform out of some old starboard I had laying around set the tank in that and used a Stainless steal tie down that I had laying around.